I like to make this for breakfast, as snack or side dish as it is simple and fast, only minimal cleaning is required. 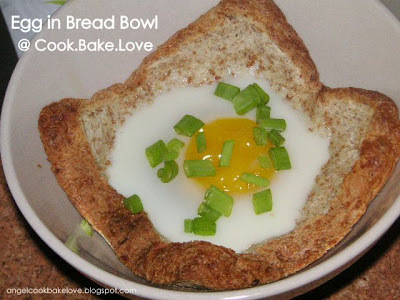 Perfect alternative for a sunny side up or half boiled egg. 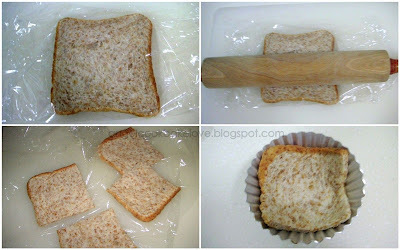 1) Cover bread with cling wrap and use a roller pin to roll it flat (or use hand to flatten it). Fit it into a bowl or tart mould. 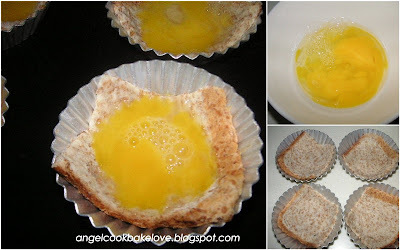 2) Add whole egg or spoonful of beaten egg on the bread. 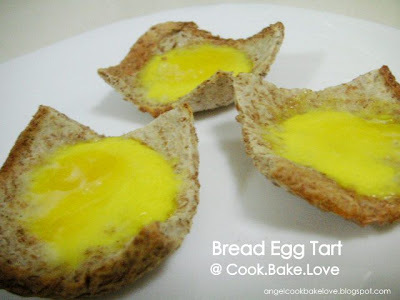 3) Bake in preheated oven at 180C (or use a toaster will do) for about 3 -5 mins till the egg is cooked to your preference (fully cooked or partially cooked). 4) Serve with seasoning and garnish with spring onion. I like this idea, simple yet looks delicious, will try this coming weekend! Simple and nice! Makes a wholesome breakfast! I like this ;D Quick and easy! I'll try to do this some day for brunch. Isn't this nice? It's a small extra effort, but the results looks fantastic! great idea, next time I can use those bread soon to expire to make this, Thanks for sharing. Wow this is good, a very simple yet nutritious breakfast.. This is really creative...simple and beautiful. Looks delicious. Would be great for party. these looks gd and simple! Thank you for your lovely comments. The pictures was actually taken more than one year ago but I didn't bother to post up. I didn't expect this simple snack is so well received. haha. Since it is so easy to make, do try it out and show me your version ok? I am sure you can do it more nicely. Aw, ever thought that bread can be used as the shells of egg custard. Thanks for leaving me a comment and it makes my day. I admire your cooking and baking skill. Love your blog and all your food photos. 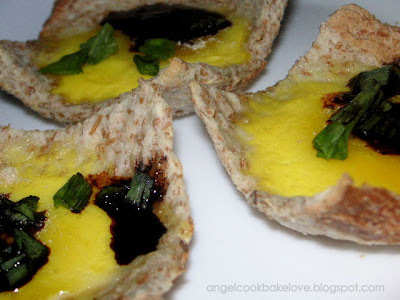 Another recipe for Sarah's school breakfast, xie xie!